Even though fibromyalgia is an invisible illness, it has some very visible effects on relationships and dating. So what should you expect when dating someone with fibromyalgia - or what realities should you expect to explain if you’re dating and you have fibromyalgia? 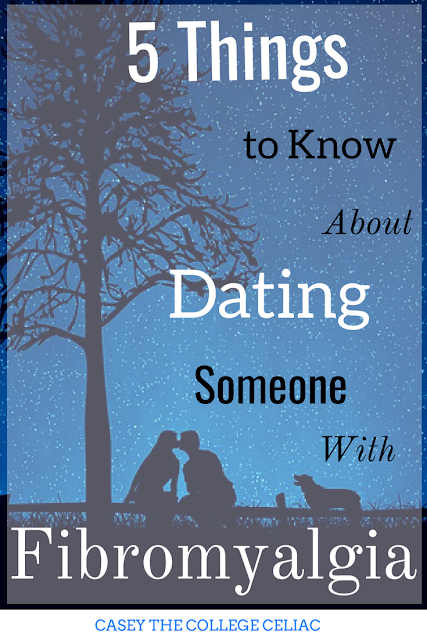 Considering that I was diagnosed with fibromyalgia at age 11, I’ve certainly learned from experience that I’m not a “normal” date - and that, sometimes, I need a little extra TLC in relationships. So today, I’m getting real about romance while chronically ill and talking about five things people should know about dating someone with fibromyalgia. 1. We have to cancel plans. Regularly. I get it. No one likes it when someone constantly cancels plans. When you’re dating someone with fibromyalgia, though, expect that changes in plans will happen. We can go from feeling great to having a migraine that feels like our head will explode in just an hour, and sometimes that means we can’t do what we said we would. So if you can be flexible and understanding with your plans, your date with fibromyalgia will seriously appreciate it. If you want, you can still offer to come over and do something more low-key than originally planned (like getting takeout and watching Netflix instead of eating out at a fancy restaurant). Just don’t be offended if we say no. In my experience, sometimes having company makes fibromyalgia flare ups a lot more bearable. Other times, I just want (and need) to be alone. But the offer to help with our fibromyalgia pain any way you can is always appreciated. Just as much as we appreciate people taking our canceled plans in stride and knowing we canceled because of our chronic illness, not because we’re “flaky” or “anti-social” or want to avoid you. 2. 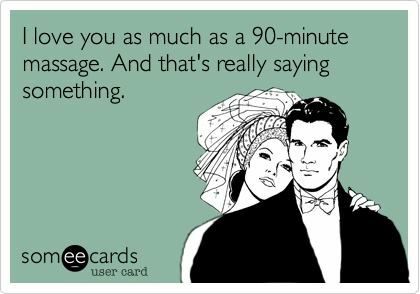 We're always super excited for a massage. Obviously, some people are more comfortable with being touched than others, so always ask before you decide to channel your inner masseuse! However, at least in my experience, people with fibromyalgia rarely turn down a back rub, foot massage or anything in between. After all, even though we may not (want to) talk about it, we are in pain. All. The. Time. So when someone cares enough about me to ask how they can help and offer to rub my tight shoulders, that’s a big win in my book. 3. We may need to avoid certain foods to feel our best. Everyone with fibromyalgia is different, and so are people’s treatments for fibromyalgia. 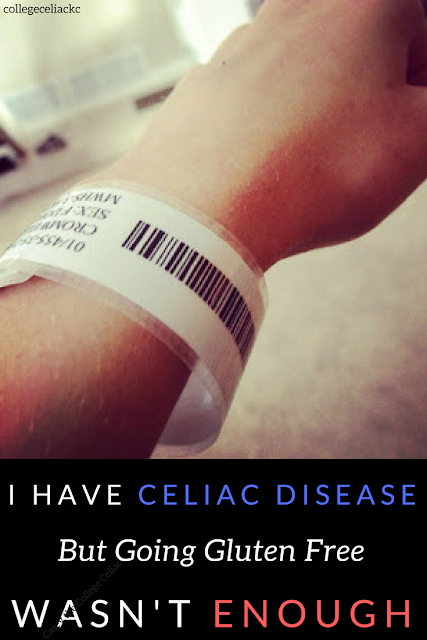 However, more and more research is connecting gluten and FODMAPs to fibromyalgia pain. I also know from personal experience that people with fibromyalgia can have certain edible “triggers” that increase fibromyalgia pain, like large amounts of corn for me. As a result, when you’re dating someone with fibromyalgia, you might also be dating someone with dietary restrictions. And that can be, well, frustrating when you want to eat at a certain restaurant but it’s not safe for your date or when you want to get your date an edible present but never know what he or she can actually eat. 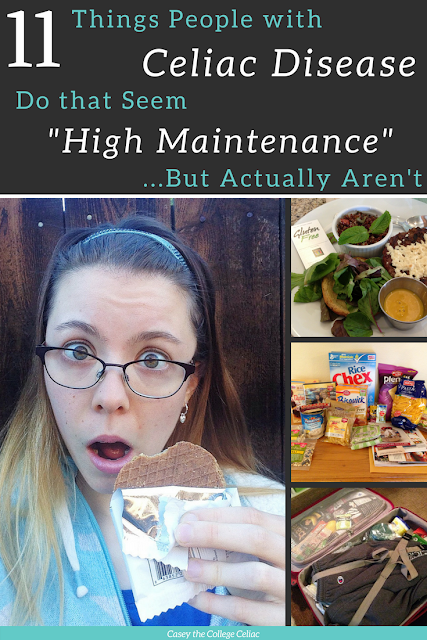 But if you accept that we need to eat a certain way to feel our best, ask about our diet and help us eat deliciously with those restrictions, and make us feel like we’re not a “burden” for our dietary limitations...well, you will be GREATLY appreciated. 4. What we "can do" changes every day...and it can hurt to watch us hurting. One of the hardest parts about living with fibromyalgia is how quickly our symptoms can change. 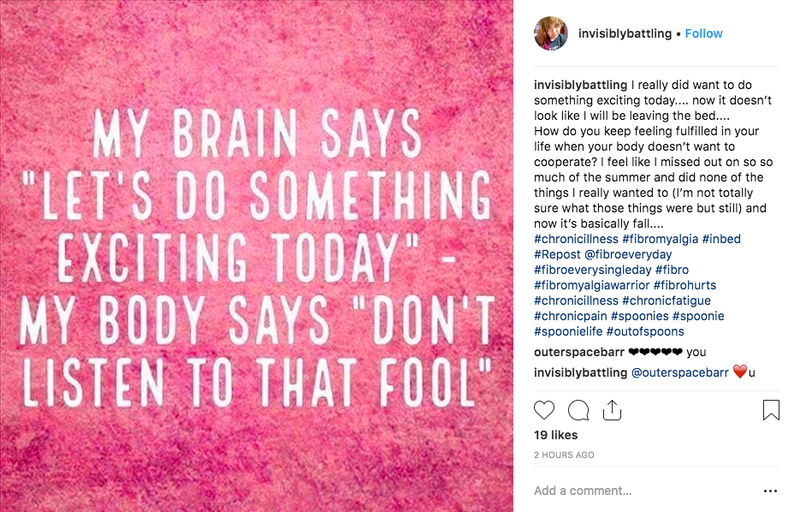 Some days, we feel awesome...and then we overexert ourselves or eat something that doesn’t agree with us or just get unlucky, and we are stuck in bed or turned into a “fibro fog” zombie for days. Even more frustrating than these changing fibromyalgia symptoms, though, is the powerlessness that you may feel as a significant other. Sometimes, nothing - no massages, special meals, ice packs, heat packs, etc. - helps with the pain. Sometimes, we cry because we’re hurting and it’s not fair and we just want to be “normal” for once! And seeing us hurting without being able to “fix” our pain can be, well, freaking hard. I don’t have any magical coping mechanisms to share for seeing your date in pain. It’s a struggle I’ve witnessed in my parents (my mother has fibromyalgia), as well as in relationships of friends with fibromyalgia. And, of course, I’ve experienced it personally as well. My biggest piece of advice is to know that this my-date’s-pain-hurts-me-too situation will happen if you love someone with fibromyalgia. It’s an inevitable result of loving someone in chronic pain. But you can control how you react to these feelings (i.e., by getting angry and blaming your date, or by acknowledging the cruddy situation and trying to still act out of love instead). And even if you can’t take away our pain, just knowing that you’re there for us - to watch Netflix, to cuddle in bed for hours, to just say, “This stinks but know I still care about you.” - when we’re at our lowest can make a big difference. 5. Having someone believe in us - and the realness of our invisible pain - is priceless. So if you believe us when we say that we have an invisible illness that causes us to hurt almost every hour of every day? That’s pretty dang special. As mentioned earlier, everyone with fibromyalgia is different and they may react differently to being asked for more details about what living with fibromyalgia is like. Personally, though, I’m grateful when people care enough to ask what a “regular” day of life with fibromyalgia feels like for me, what they can do to help me during a fibromyalgia flare, and more details about what fibromyalgia is in the first place. For better or for worse, fibromyalgia is who we are. So if you love someone with fibromyalgia or are just dating a fibromyalgia warrior, knowing a little more about what this chronic illness is like can also help you understand us better as well. And if you love us on our good days and bad days, when we’re pain-free and when we’re taking painkillers like vitamins...we’ll love you for it. The truth is, whether you’re the person with fibromyalgia or the person dating someone who has it, dating can be a little more complicated. A healthy, happy relationship can require a little extra flexibility, lots of honest conversations about how your chronic illness impacts your life, date night restaurants that can accommodate a special diet, and much more. I firmly believe, however, that people do not have to be 100% healthy to be 100% worthy of love. Just like I believe that dating someone with fibromyalgia can have some hilariously accurate benefits (like the nine I list here). Like this post? Tweet me some love by clicking here: "What should you know about dating someone with #fibromyalgia or dating while you have a #chronicillness? 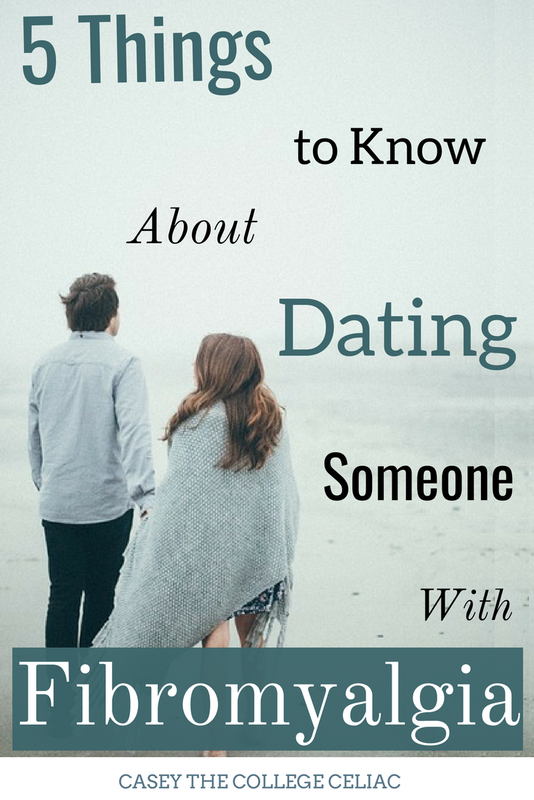 Read 5 things I want everyone to know about #fibro and #relationships here --> http://bit.ly/2LOf5AC #invisibleillness"
So if you’re dating someone with fibromyalgia and don’t know where to begin, just know this: we do need a few special accommodations because of our chronic illness but, at the end of the day, we’re just people. People looking for love...and excited to find someone worthy of giving ours to. What else should people know about dating someone with fibromyalgia - or another chronic illness? How do you navigate dating with chronic illness? Tell me in the comments!